The Onion, without the jokes. (Press release: In order to further cut expenses and make text fit into its new reduced size, the Chicago Tribune has announced it will randomly omit letters from excessively large words. "In today's challenging environment," explains chief innovation officer Lee Abrams, "people don't have time for long words. By eliminating anachronisms like double consonants, we are providing the kind of breezier read today's subscribers demand, while letting us reduce our news hole by another .715%. Win, win, all around." I must be sick. It's not even Halloween, and we're already posting October's calendar of architectural events. We promise to try to get back into our usual sloppy routine next month. So what do you get in October? I have just one word for you: polycarbonate (it's all around you, you know.) Plus, there's Solon S. Beman and Christian Science, Werner Sobek and SOM's William Baker at IIT, Preston Scott Cohen and Paul Florian at UIC, CNU Illinois' 2008 conference, Frank Lloyd Wright at Florida Southern, Shanghai Transforming, a new exhibition at CAF, Alfonso Iannelli, a Adrian Smith+Gordon Gill Architecture office tour, and a review of recently designated or proposed Chicago landmark. 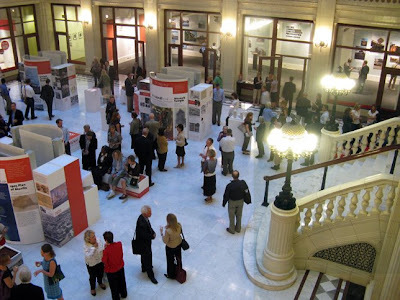 There are over 60 architectural events on the October calendar. Check it all out here. 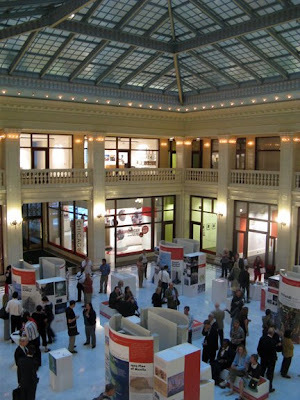 A reminder that Preservation Chicago, the city's grass-roots architectural preservation organization, will be throwing it's 2008 "Preservation Celebration" benefit this Friday, September 26th, 6:00 - 9:00 P.M., at the Marmon Grand in Chicago's Motor Row Historic District, 2230 S. Michigan. The evening will include an open bar, hors d’oeuvres, a silent auction and music by the Erwin Helfer Trio. Tickets are $75.00 in advance, $95.00 at the door. More information here. For those who are gluttons for punishment, I will be giving three, free 30 minute "Curator Talks", Tuesday September 30th 5:3o to 6:00 P.M., Saturday, October 18th, 11 A.M. to 11:30 A.M., and Friday, November 7th, 12:30 to 1 :00 P.M. Gather at ArcelorMittal CitySpace Gallery at 224 South Michigan. The CAF has also arranged for gallery visits at three of the firms whose work is on display in the exhibition, including Adrian Smith+Gordon Gill Architecture LLP on October 28, Goettsch Partners on November 6th, and Skidmore, Owings and Merrill LLP on November 11th. $15.00, $10.00 for CAF members and students. These are rare opportunities and space is limited, so if you're interested, I'd book your reservation now, here. You can see all of CAF's upcoming Boom Towns! programs, including two that will be co-sponsored and part of this year's Chicago Humanities Festival, here. And also make sure to catch Shanghai Transforming, curated by architect and urban planner and the guy who brought us all those great Tschotskes back from Xintiandi, Iker Gill. A companion to Iker's book of the same name, it's a great look at one an old city that is also one of the 21st century Book Towns "immersed in a deep physical transformation." 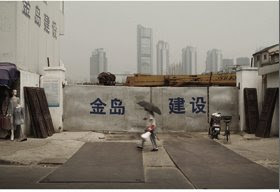 Shanghai opens October 14th and runs through January 9th. Boom Towns runs through November 21st. Boom Towns! Opening Reception Tonight, 5:30 - 7:30 P.M.
A reminder that tonight marks the opening of Boom Towns! Chicago Architects Design New Worlds, an exhibition I guest-curated at the Chicago Architecture Foundation, 224 South Michigan. 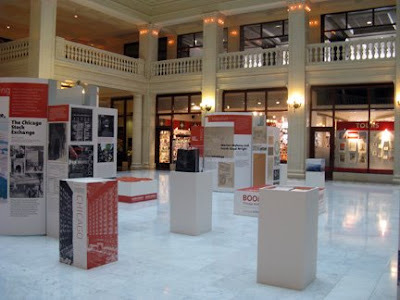 I stopped by on Saturday and saw that our designer, Jason Pickelman, has done a superb job showcasing the 14 projects by Chicago architects - 7 in 19th Century Chicago, 7 in the modern boom towns of Asia and the Middle East - that make up the exhibition, which runs through November 21st. Join me, from 5:30 to 7:30 P.M. this evening, Tuesday, September 23rd, at the CAF, 224 South Michigan. 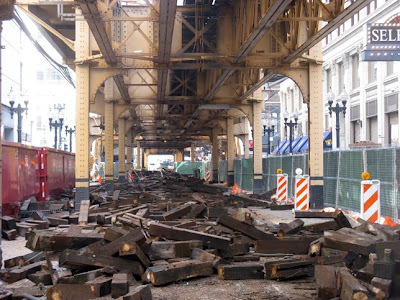 Through Thanksgiving, thousands of old wooden rail ties on the Wabash and Lake Street of the Loop "L" are being removed and replaced, resulting in weekend service being confined to Wells and Van Buren streets. 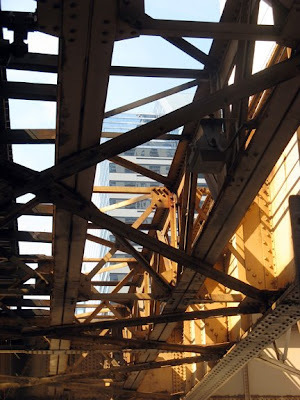 Rather than looping the loop and returning north, Brown Line trains magically change their spots at Merchandise Mart and become Midway trains headed to the airport. Last Sunday at the Mart I was able to wrangle a herd of a few dozen tourists, milling around in confusion waiting for a southbound Brown Line train that would never come, onto an about to depart train, only to see them pour off the cars again when the motorman announced that they were now on a Midway train. I finally convinced a herd leader that the train would go to Library, their apparent destination, before it went to Midway, and at last sighting everyone was again climbing aboard. I hope they made it. Right now, wherever work progresses, far more light is passing down to street than is probably safe for we vampire-like commuters accustomed to the traditional under-the-L, Dark Knight gloom. 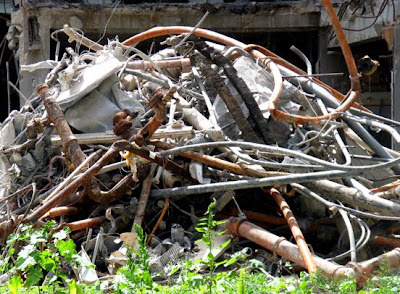 As I was taking pictures, a friendly worker on the $24,000,000 project came up to explain proudly how the ancient ties were being removed and replaced by new ties made of synthetic materials that will have a longer useful life and eliminate slow zones. 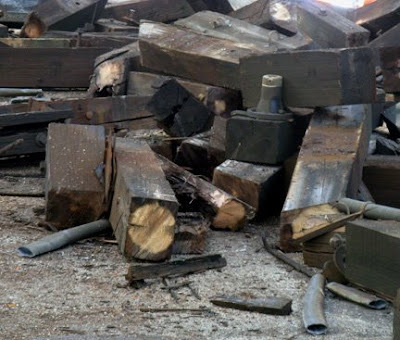 She also assured me, as I stood there doe-eyed with misplaced nostalgia, that the now exiled wooden ties would probably live on in a good recycled home. Sunday, September 21st, there will be a rare opportunity to tour Eero Saarinen (with Larry Perkins of Perkins, Wheeler & Will) landmark 1940 Crow Island School in Winnetka, national historic landmark. 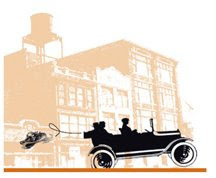 The docent-led tours, sponsored by the Winnetka Historical Society, will be offered at 1:00, 2:00 and 3:00 P.M. Meet in the lobby of school, 1112 Willow Road. Tours will also offered to the 1830's Schmidt-Burnham Log House, with a suggested donation. Perkins+ Will's Design Principal Ralph Johnson found his work being cited for excellence not once, but twice on a single day this past week. 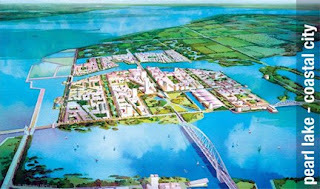 First, World Architecture Community, a new website with the ambition of being "an independent forum and extensive database" and "the 'Home Page' of architects from ALL countries of the world" announced that Johnson's 2001 master plan for Universidade Agostinho Neto in Luanda, Angola was one of an "extra 30 projects" receiving the "admiration" of WA's invited array of honorary members - an international roster of such luminaries as Kenneth Frampton, Ken Yeang, Massimiliano Fuksas and Martin Filler, to skim just two letter's worth of names - voting for the "1st Cycle" winners of the 20+10+X World Architecture Community Awards. 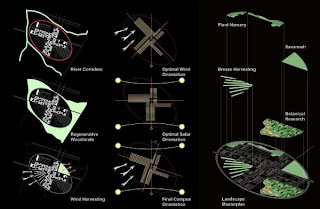 Johnson's plan for the 5,000 acre campus stresses sustainable design, with a mixture of low and high-rise buildings to create pressure differentials that will draw the natural cooling of the wind throughout the campus, and trees planted to in a way the captures breezes from the savannah. The same day, Business Week and the Architectural Record announced Johnson's One Haworth Center in Holland, Michigan as one of six winners of the 11th annual "Good Design is Good Business" international competition, honoring "innovative architecture that demonstrates exemplary design, while helping clients achieve their business goals." 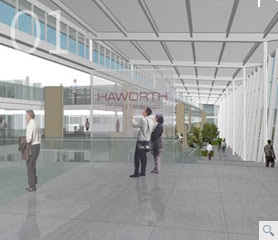 The project involved recycling and retrofitting a 1980, 1000-foot long, bunker-like building fused to the front of the Haworth factory. 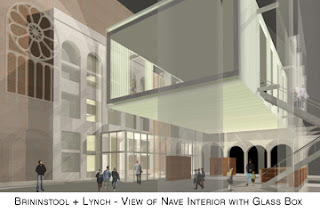 In his May review of the building, co-designed with Eva Maddox Branded Environments, the Trib's Blair Kamin seemed to be seeing the same relationship between superior design and good business: "Within the canted glass walls of the building’s atrium lies a seamlessly integrated world that is part office, part showroom, part laboratory and part museum. All the parts come together for one principal purpose: To seduce clients to buy from Haworth . 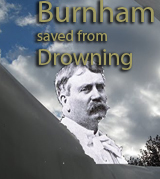 . . "
Now if only someone could talk to him about the Peshtigo . . .
Sun-Times music critic Andrew Patner brings us the bad news that health problems have forced conductor Riccardo Chailly to cancel his October appearances with the Chicago Symphony, with a major casualty being the highly-anticipated performances of Gustav Mahler's 10th Symphony, which has been dropped from the program. Although Mahler didn't live long enough to finish the symphony - it was only decades later that Deryck Cooke created a performing version of the entire work - I've come to find the 10th the most moving of all of Mahler's symphonies, even over the overwhelming 9th. In his Norton Lectures, Leonard Bernstein described the movements of the 9th symphony as a series of farewells, the last a farewell to life, itself. To me, the greatness of the 10th comes from Mahler being in an even darker place. His eldest daughter had died, aged four, in 1907. 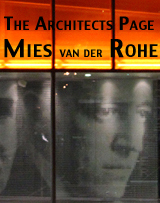 He knew his beloved wife Alma was unfaithful, having an affair with Walter Gropius. He would soon die, and those he loved would love others. The despair one hears in the 10th is among of the deepest you can encounter in art. 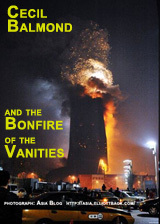 It includes a brutal, dissonant tutti chord like a tsunami of chaos, and a screaming, high-pitched trumpet that evokes the ear-piercing sound of an air raid signal, a prophecy in music of the cascade of terror that the atrocities of the 20th century would soon bring. There's no more bleaker moment in all of music than the huge dull, widely spaced whacks on a muffled drum that lead into the Tenth Symphony's last moment. Yet, ultimately, even amidst more moments of horror, Mahler brings the last music he would write to an extraordinary place of grace. While I come away from a performance of the 9th with a sense not only of rage, but self-pity, what I hear in the Tenth is something very different: a man who finds himself at his own end, and sees beyond it. The things of life, and the people he holds most dear, to the point of defining his being, will endure and flourish, even as he, himself, is totally annihilated. What I hear in this last artistic testament, in the tender outbursts of passion, and the way his melodic elements fold gently back into themselves like whispered asides, is Mahler, with heart-rending emotion, reconciling his deepest longings with a loving farewell - fare you well - to everything he cherished most, the things that were life, itself, that he must now let go as they slip irretrievably away. Join Me next Tuesday, September 23rd for Boom Towns! Late last year, curator Greg Dreicer approached me about curating an exhibition at the Chicago Architecture Foundation. After failing to convince him, over several encounters, that this was a very bad idea, I agreed to do in less than six months what I've since learned is usually done over several years: an ambitious exhibition attempting to define the place of Chicago architects in the world today. Well, it's Show Time! Boom Towns! Chicago Architects Design New Worlds, designed by Jason Pickleman, one of Chicago's hottest young talents, opens next Tuesday, September 23rd, with a reception at the CAF, 224 South Michigan, from 5:30 to 7:30 P.M. You're all invited, dear readers, and I'm pretty sure you'll have a good time. I long ago lost all objectivity about this project, but I think the concept Greg and I finally arrived at was a strong one. 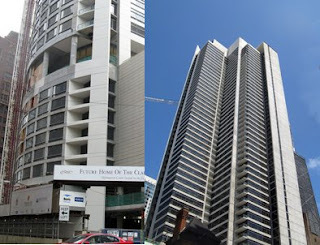 We compare Chicago architects' signature projects - those that were clearly intended to stand out and define a certain type of building - in a series of pairings from two divergent locales and eras: the boom town of late 19th century Chicago and today's boom towns in Asia and the Middle East. In the 1890's, Chicago architects did most of their best work in their home city, and the result is one of the richest architectural legacies to be found anywhere. Today's Chicago architects must compete on a world stage, and their ambitious projects are as liable, probably more liable, to be built in Shanghai or Dubai or Hyderabad than here. 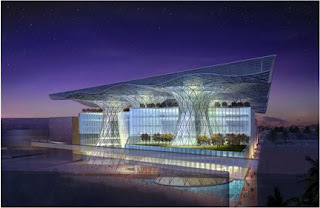 And so we have, for example, Solon Bemen's largely forgotten 1890 Grand Central Station, pictured to the left in the banner at the top of this post, paired with Murphy/Jahn's spectacular Suvarnabhumi Airport in Bangkok, Thailand, shown to the right. Another coupling contrasts Daniel Burnham's plan for Manila, in America's then newly acquired territory of the Phillipines, with Skidmore, Owings & Merrill's eco-plan for Chongming Island, the world's largest alluvial island, just outside of Shanghai. 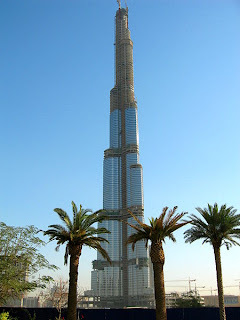 William LeBaron Jenney's Home Insurance building, often cited as the world's first true skyscraper, is paired with SOM's Burj Dubai, now the world's tallest building, and Ross Wimer's twisting Infinity Tower in Dubai. Louis Sullivan's 1893 Stock Exchange Building matches up with Goettsch Partner's new stock exchange complex on Sowwah Island in Abu Dhabi. 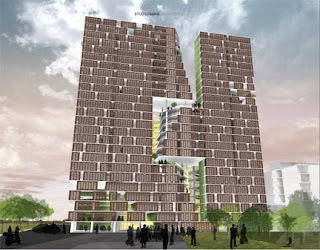 1890's legendary Mecca Flats, on a site now occupied by Mies van der Rohe's Crown Hall on the IIT campus, is contrasted with Studio/Gang's spectacular residential tower in Hyderabad, India. The company town of Pullman, on Chicago's far south side, finds its modern counterpart in a very different kind of company town, Abu Dhabi's Masdar City, where Smith+Gill Architects' hugely innovative Masdar Headquarters is a city-within-a-city that is designed to produce more energy than it consumes. 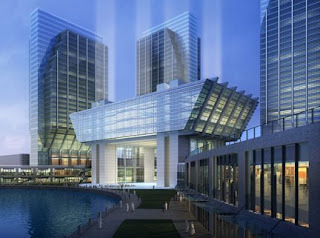 And Burnham and Root's 1892 Masonic Temple, at the time of its construction the world's tallest building and including what was perhaps the world's first vertical shopping mall, is compared to Xintiandi, Ben Wood's highly influential project that uses traditional Chinese architecture to create an innovative lifestyle center that is one of the most popular attractions in Shanghai. These are all the spectacular projects. If it turns out we sometimes fail to do them full justice, blame me, because everyone at CAF, from curator Greg Dreicer, to Mike Hollander who assembled the images (a herculean task, believe me), editor Katherine Keleman, program directors Barbara Gordon and Whitney Moeller, CAF President Lynn Osmond and the entire staff and, of course, the aforementioned Mr. Pickleman, have done an amazing job getting this exhibition into shape on an extremely tight deadline, and the participating architects have all been extremely generous with their resources and time. I'll be writing more about this project later, including a photo-essay on Pullman as it survives today, but it's now in your hands. Join me next Tuesday evening at CAF and you get to critique my work. But, as Deborah Kerr once said, "When you talk about this in the future, and you will talk about it, please be kind. . . " It's my first time. Boom Towns! 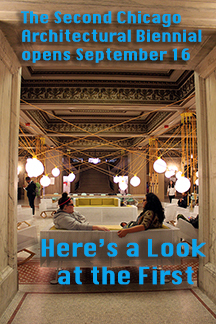 Chicago Architects Design New Worlds opens Tuesday, September 23rd, 5:30 to 7:30 P.M., at the Chicago Architecture Foundation, 224 South Michigan. The exhibition runs through November 21st. 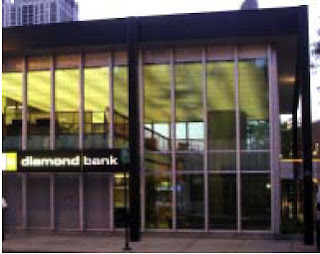 Docomomo-chicago.midwest reminds us that the Commission on Chicago Landmarks will be holding a public hearing on Wednesday, September 17th on the proposed designation of the North Federal Savings and Loan Bank, now Diamond Bank, at North Avenue and Clark Street. 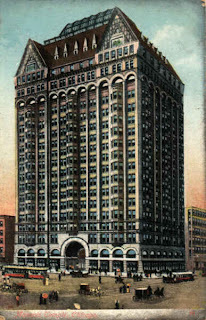 The structure was one of a group of sixteen bank buildings proposed for landmarking last year. It is the only modernist design among the group, and the fact that only now is a public hearing being held would indicate that the designation is meeting resistance. 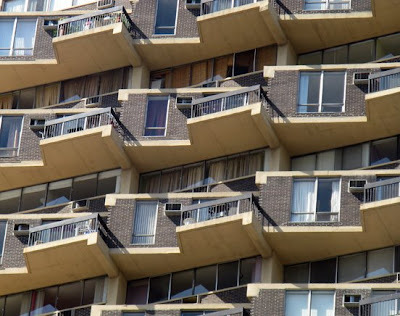 I've written before about Murphy and Naess's 1961 design, and caught some flak from those who didn't think it worth preserving, but now I'm even more convinced it demands protection. The brief describes the building as being influenced by Gordon Bunshaft/SOM's iconic Manufacturers Trust building on Park Avenue in New York. 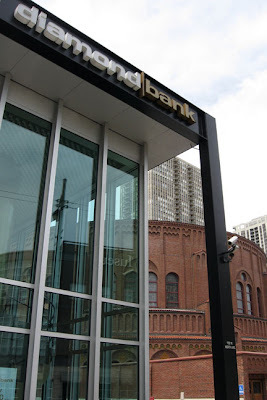 As opposed of the traditional fortress-like models used for banks, North Federal stresses openness and transparency, with the interior of the bank - and its functioning - clearly visible from the street. A floating second-floor mezzanine stresses the container-like aspect of the black steel frame into which the light curtain wall is set and recessed. To call North Federal a jewel box is no understatement. 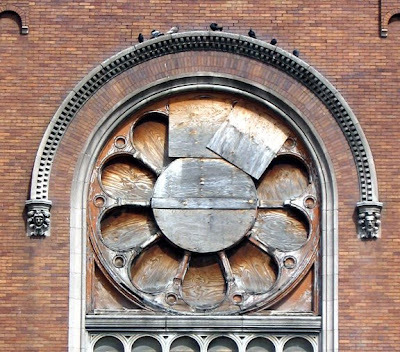 Almost perfectly intact, it is a wholely unique piece of Chicago's architectural heritage. The hearing will be held Wednesday at 9:30 A.M., at City Hall, 121 N. LaSalle, Room 201-A. 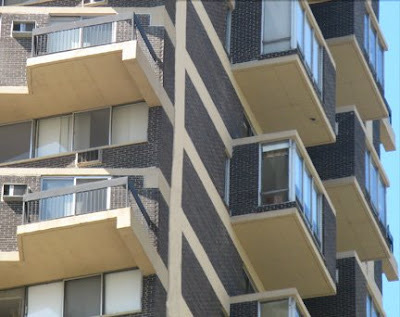 Further information, including street and e-mail addresses, and phone numbers where expressions of support can be made to commissioners and 42nd ward alderman Vi Daley can be found on the docomomo-chicago.midwest website here. 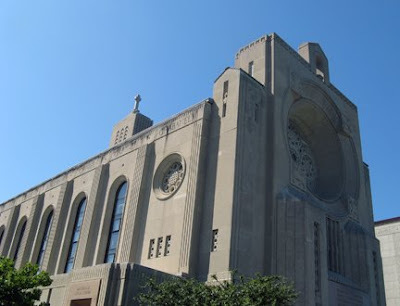 Crain's Chicago Business reported this week that the Archdiocese of Chicago has issued an RFP (request for proposal) for St. Boniface Church. Crain's says a pre-submittal conference is scheduled for September 30. 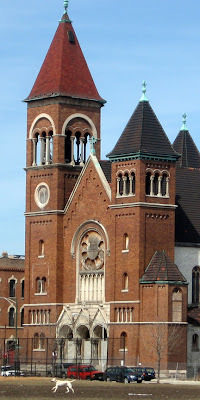 Although it's 130-foot-high bell tower continues to dominate its West Town neighborhood, the church, designed by architect Henry J. Schlacks in 1902, has been shuttered since 1989. In 2003, the Archdiocese held an architectural competition for proposals for the site that attracted entries from such stellar Chicago firms as Studio/Gang, Booth Hansen, A. Epstein, and winner Brininstool and Lynch. You can find a great deal of information on St. Boniface on the web. My article on the competition and the pitfalls and controversies surrounding the preservation of the city's historic churches, including photo's and renderings, can be found here. Saint Boniface: A Community Concerned includes information on the church's history, and the battle to save it. 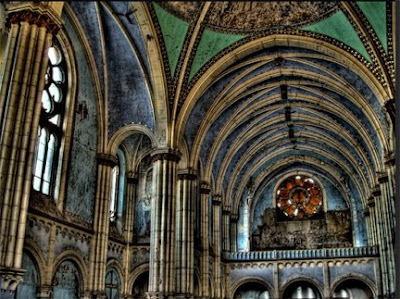 It includes a generous photo gallery, and more images on the church, still spectacular even in its current abandoned state, can be found on the websites of Josh Gibson's and Carey Primeau, an example of which is shown above. Needless to say, none of the ideas of that competition have been carried forward. 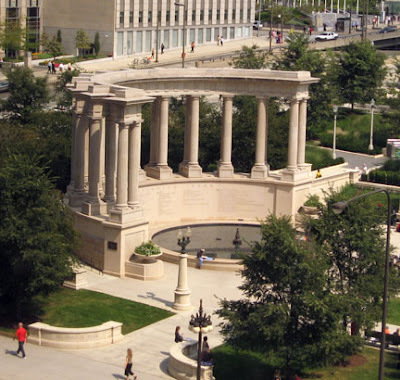 In the Chicago Historic Resources Survey, St. Boniface is rated "Orange" - for possessing " some architectural feature or historical association that [makes it] potentially significant in the context of the surrounding community." Crain's quotes commissioner of planning and development Arnold Randall as saying his department, which includes the Commission on Chicago Landmarks, "encourages" preservation of the church, and of the facades of an adjacent school building that was demolished in 2004. November 7th is the deadline for submission of proposals to the, it is hoped, not ironically named Landmark Realty & Development LLC. 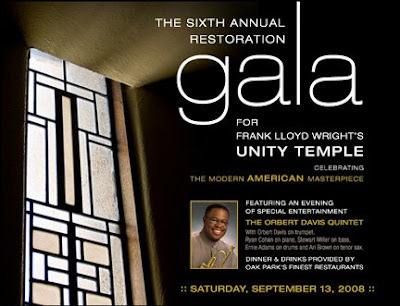 The Unity Temple Restoration Foundation, the group behind the preservation and restoration of Frank Lloyd Wright's Oak Part masterpiece, is holding its sixth annual gala this Saturday night, which includes drinks and dinner, "provided by Oak Park's Finest Restaurants", at 6:00 P.M., a performance by the Orbert Davis Quintet at 7:30, followed by desert, an auction and additional music. Tickets are $100 per person - $150 for patron level and $80.00 for student sponsorships. You were supposed to reserve your place by this past Wednesday, but if you mention you say this item on my blog they'll probably remember I'm habitually tardy and may still get you in. Call 708/383.8873.
. . . explores the relationship between movement and architecture featuring choreographed episodes interacting with four architectural installations, representing position, enclosure, proximity and compression. 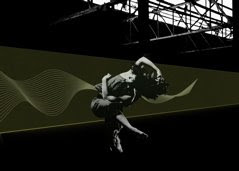 As the audience and performers move within and around the installations, their movement will be digitally captured via motion sensors and cameras, simultaneously translated into a visual organic representation and then transferred onto the garage’s architectural surfaces and enclosures adding an additional visual layer to this performance. 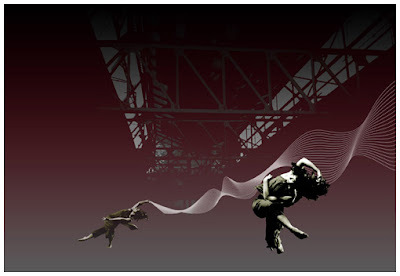 The dance, choreographed by artistic director Carrie Hanson and performed by eleven dancers in five different areas throughout the garage, including an existing cargo container, will reveal the body’s capacity to interact within these dynamic environments while affecting and inscribing the space. Other Convergence contributors are media designer Peter Gogarty and fashion designer Lara Miller. Performances will take place this weekend at 2300 South Archer - Friday, September 12th at 7 P.M. and Saturday, September 13th at 8:30. A donation of $20.00 is suggested for tickets, which can be purchased at the door. A benefit gala, including food, beverages, and live music by Chicago's Hello Dave, will take place beginning at 7 P.M. on Saturday, with a suggested of $75.00 for ticket, two for $100.00. Information: 312.328.0303 or on-line. 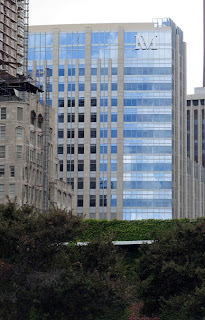 It may not get the spotlight as much as high profile firms like Lucien Lagrange or SOM, but O'Donnell, Wicklund, Pigozzi & Peterson (OWP&P to you) has had a major impact on Chicago's cityscape, designing schools (Northside College Prep), hospitals (Advocate Lutheran General) and shopping centers (The Shops at North Bridge, thankfully no longer a Westfield Shoppingtowne). 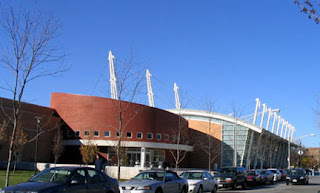 Working both as architects-of-record (for Cesar Pelli's Ratner Athletic Center at the U of C), and design principals (the new Northwestern Prentice Women's Hospital, with VOA), OWP&P has been a major part of Chicago's architectural scene. 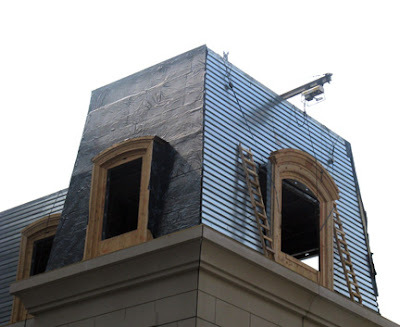 Under current leader John Syvertsen, it's been a major contributor to sustainable architecture in the city, creating "green" for public schools and police stations, and playing a major role in the creation of Chicago's award-winning Green Home program. 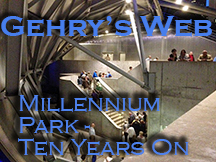 Tonight, OWP&P's 300+ employees and a few close friends will be celebrating their 50th anniversary with a big blow-out at Wrigley Square at Millennium Park, which the firm helped reconstruct. The weather forecast calls for clear skies and warming temperatures, perfect for basking in their own handiwork, a key part of Chicago's new, now world-famous front yard. Congrats, and best wishes to everyone at OWP&P. 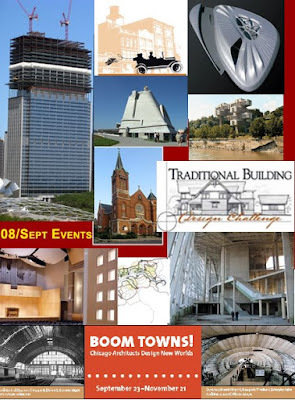 It's the 8th of the month: Must be Time for the September Calendar of Architectural Events! Yeah, I know, we're late. Apologies to the folks at Pecha Kucha at not getting up the September calendar up in time to promote what was undoubtedly another fine outing. We still don't have absolutely everything in, but there are already over three dozen September events: Peter Eisenman at UIC, UIC's Robert Somol talking on Whatever at IIT, traditionalists massing at Navy Pier for a three day conference and exhibition, Landmarks Illinois's new President Jim Peters discussing the Chicagoland watch list, Thomas Corning on the construction of the 24 story addition rising above the Blue Cross/Blue Shield Building, Rico Cedro and Gunny Harboe discussing the rehab of Mies van der Rohe's landmark 860-880 Lake Shore Drive Apartments, Thomas Vietzke and Jens Borstelmann talking about Zaha Hadid's Nordpark, a panel on Communist Avant-Garde architecture at CAF, Jose Oubrerie and Sanford Kwinter in separate lectures at UIC, a gallery talk by yours truly on CAF's new exhibition Boom Towns! 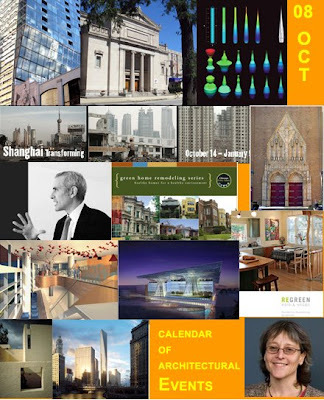 contrasting signature projects in 19th Century and 21st century Asia and the Middle East, , Rolf Achilles lecturing on 19th Century furniture at Glessner House, Preservation Chicago's big benefit at the Marmon Grand in the Motor Row Historic District, DLK's Diane Legge Kemp discussing planning in China's rust belt and much, much more. See all the events here. UPDATE: Ok, so I can't tell time either. Start times are actually two hours earlier than originally posted. Updates made. Turangalîla/Aimard/Berlin Phil/Rattle - Need We Say More? You have only three days left to hear it. Turangalîla is the kind of universe embracing symphony that Gustav Mahler might have written if he had lived into his 90's and been kidnapped by Hare Krishna's. As the great composer, however, survived only to 51 and never visited an airport, it was left to Frenchman Oliver Messiaen to compose the Turangalîla-Symphonie, one of the landmarks of 20th century music, which was debuted in 1949 by the Boston Symphony conducted by a young Leonard Bernstein, who apparently never went anywhere near the work again. Sprawling across ten movements and 80 or more minutes and deploying a massive orchestra, the Turangalîla was described by its composer as a "song of love." When I first encountered the work, in a performance, again by the Boston Symphony, then led by Seiji Ozawa, in the same Paris concert hall where the 1913 premiere of Stravinsky's Le Sacre du Printemps provoked a riot, I was both enthralled and taken aback by the clash of often naive-sounding melodies and jagged, jarring rhythms. Subsequent hearings later, now comfortable with Messiaen's distinctive idiom, I find the Turangalîla one of the most enthralling, ectastic works you're ever likely to encounter. So, clean out your ears, put your prejudices and expectations aside, and turn here, where, for the next three days only, you'll be able to stream the crackerjack London Proms performance of Turangalîla with pianist Pierre-Laurent Aimard, ondes martenot player Tristan(!) Murail, and the Berlin Philharmonic conducted by Simon Rattle. It'll be a great warm-up for the Netherlands Opera Proms performance of Messiaen's six-hour Saint Francis of Assisi, coming up on Sunday. 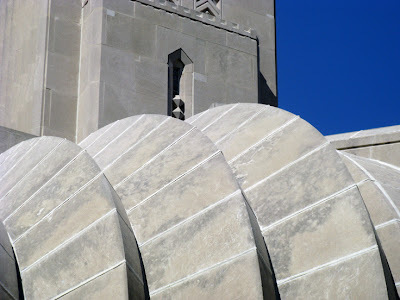 Madonna della Strada Chapel, Loyola University, 1939, Andrew Rebori, architect. Designated an official Chicago landmark in 2004. 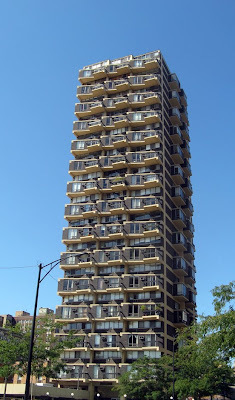 You may call it a delight, or you may call it an eyesore, but one of the most distinctive buildings along Sheridan Road - or in Chicago, for that matter - is the Granville Tower, at 6166 North, 29 stories tall and completed in 1965 to a design by Seymour S. Goldstein, Ltd.
Its weirdly contorted facades, which bring to mind Oscar Wilde's description of the Water Tower as a "monstrosity with pepper boxes stuck all over it", actually have a logical relation to the plan, which was made up entirely of duplex units with bedrooms on the upper levels. Seen from a distance on a day when bright blue skies put the structure into high contrast, all those zits broken out across its face destabilize your ability to see the tower as a stable, solid object; it almost seems to be folding and crumbling right before you eyes. 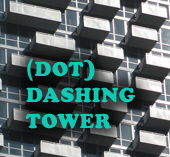 Viewed at closer range, the box-like extensions and diagonal balconies give the building a sort of surreal, archaic flair, suggesting everything from an architect's worst hangover, a wall of cliff dwellings, or, perhaps, the world's tallest Jenga game. 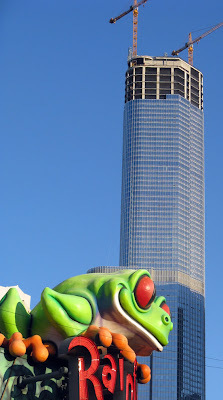 The fall season of architectural events is revving up with a vengeance. 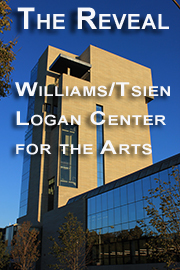 Today, Wednesday, September 3rd, the Illinois Institute of Technology has two worthwhile events. 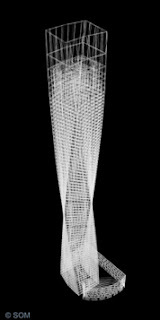 Pearl River Tower - at 3:30 P.M. in the Rem Koolhaas-designed, McCormick Tribune Student Center, Roger Frechette of Skidmore, Owings & Merill will talk on the firm's Pearl River Tower in Guangzhou, China, a 71-story skyscraper designed as a "zero-energy" structure that produces as much energy as it consumers. 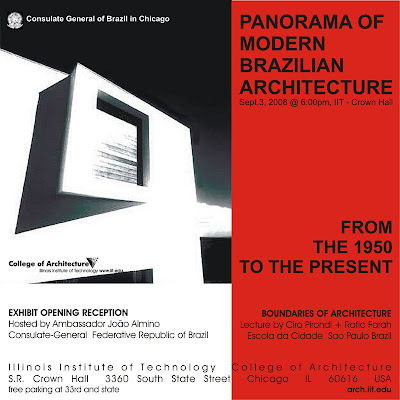 Panorama of Modern Brazilian Architecture - tonight at 6:00 P.M. in the Mies van der Rohe designed Crown Hall, 3360 S. State, there will be an opening reception for a new exhibition, to be followed by a lecture, Boundaries of Architecture, by Ciro Pirondi + Rafic Farah of Escola da Cidade in Sao Paulo. The exhibition, which includes 58 panels and runs through September 30th, includes, among others, the work of Oscar Niemeyer, still working at 100, Lina Bo Bardi and 2008 Pritzker Prize winner Paulo Mendes da Rocha.